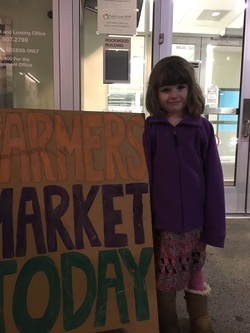 In Ecumenical Ministries of Oregon’s 2012 Community Food Assessment of the Rockwood neighborhood, a farmers market was the number one additional food resource desired by community members. Four pilot market days were held in October 2014. The Rockwood Farmers Market has gained the support of the City of Gresham and is included in the Gresham Redevelopment Commission’s creation of an innovative food ecosystem on the market site. There will be spaces for restaurants and facilities to support emerging food enterprises, and the RFM will be an integral part of this cluster of food enterprises. 2015 was the first full market season for the Rockwood Farmers Market! The outdoor season ran weekly from the first week of June to the end of October and was supported by a small group of tireless vendors and volunteers and wonderful market goers and shoppers. The SNAP match program allowed people to use their EBT cards to purchase produce at the market and to have their money matched dollar for dollar. This match increased from $5 at the beginning of the season to $10 starting in September due to a generous sponsorship from Whole Foods Market. The market continued with a once a month indoor market featuring winter fruits and vegetables, tamales, craft vendors and a variety of community organizations. The RFM moves into its second full season in 2016 excited to work together with community members, farmers and local organizations to build up the market. We are excited to bring in new produce and prepared food vendors, a weekly Market Sprouts kids' activity program, and performers and food sampling at the market. The RFM will begin the second weekend of June and we look forward to seeing you out at the market!